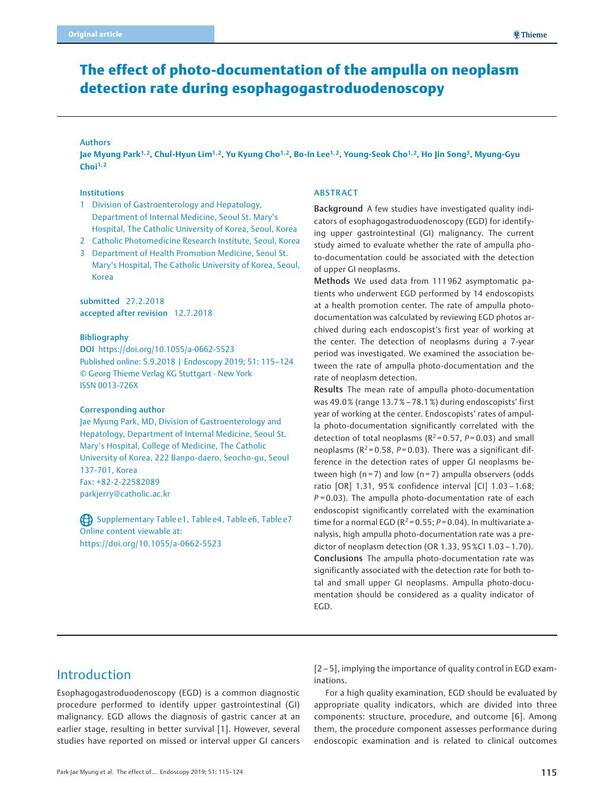 Background A few studies have investigated quality indicators of esophagogastroduodenoscopy (EGD) for identifying upper gastrointestinal (GI) malignancy. The current study aimed to evaluate whether the rate of ampulla photo-documentation could be associated with the detection of upper GI neoplasms. Methods We used data from 111 962 asymptomatic patients who underwent EGD performed by 14 endoscopists at a health promotion center. The rate of ampulla photo-documentation was calculated by reviewing EGD photos archived during each endoscopist’s first year of working at the center. The detection of neoplasms during a 7-year period was investigated. We examined the association between the rate of ampulla photo-documentation and the rate of neoplasm detection. Results The mean rate of ampulla photo-documentation was 49.0 % (range 13.7 % – 78.1 %) during endoscopists’ first year of working at the center. Endoscopists’ rates of ampulla photo-documentation significantly correlated with the detection of total neoplasms (R2 = 0.57, P = 0.03) and small neoplasms (R2 = 0.58, P = 0.03). There was a significant difference in the detection rates of upper GI neoplasms between high (n = 7) and low (n = 7) ampulla observers (odds ratio [OR] 1.31, 95 % confidence interval [CI] 1.03 – 1.68; P = 0.03). The ampulla photo-documentation rate of each endoscopist significantly correlated with the examination time for a normal EGD (R2 = 0.55; P = 0.04). In multivariate analysis, high ampulla photo-documentation rate was a predictor of neoplasm detection (OR 1.33, 95 %CI 1.03 – 1.70). Conclusions The ampulla photo-documentation rate was significantly associated with the detection rate for both total and small upper GI neoplasms. Ampulla photo-documentation should be considered as a quality indicator of EGD.